Front: Ride SA Map with names of popular rides. Back: Small Wild@Heart 2-colour logo just below collar. 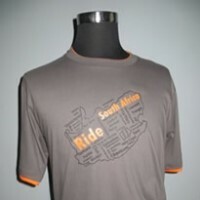 Grey T-shirt with orange trim around neckline and sleeves. Front: Meet myfriends graphic in black and white. Left Arm: Small Wild@Heart 3-colour logo. Generous Fit - Slightly larger than normal, with wider and longer sleeves. 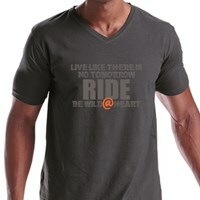 Front: Live Like design in light grey and orange. 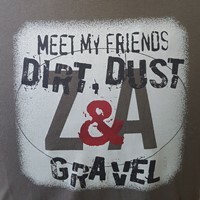 Charcoal Grey short sleeve T-shirt with V-Neck. 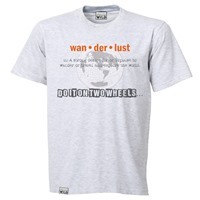 Front: Wanderlust design with definition and map in charcoal grey and orange. Back: Small Wild@Heart 2-colour logo on bottom right. Soft, melange grey short sleeve T-shirt with slightly longer sleeves. 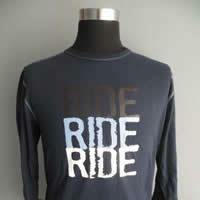 Front: Ride Ride Ride in black, light blue and white. Back: Small Wild@Heart 3-colour logo just below collar. Navy blue long sleeve T-shirt with lighter blue stitch trimming. 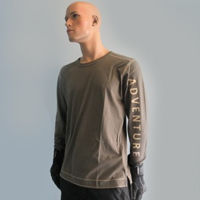 Left Arm: Vertical Adventure wording in cream beige. Back: Wild@Heart Splash Logo on bottom right. Khaki green long sleeve T-shirt with cream beige stitch trimming.